Chief Operating Officer Lauren Palumbo provided a brief snapshot of the organization: sharing statistics about our work and the scope of the network of our partner organizations. Following some general questions about the organization, we reviewed a set of new procedures, rolled out over the past few months following our work with MIT’s Leading with Impact program. The new procedures include our new partnership agreement, our annual beneficiary data audit, upcoming check-in calls with partner organizations, and annual reporting coming in 2019. Being able to share this information in person provided the necessary context and clarification which can be hard to do electronically, and we were so pleased a number of our beneficiary partners joined us today for this important session! 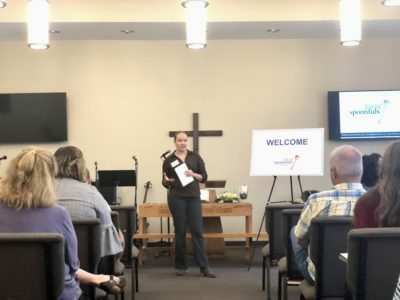 Food Rescue and Plenty Program Coordinator Cathy Pedtke led an overview of our educational & nutrition programming, including information on our recipe cards, educational website content, and workshops. Lots of great questions followed, and we expect Cathy will have a long list of potential workshop hosts soon! 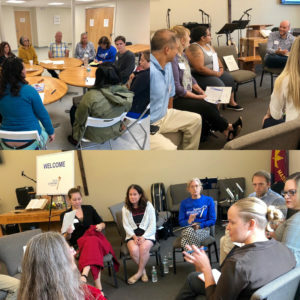 Following a short break, we broke into three discussion groups to share information and brainstorm on areas of interest to our beneficiary agencies: client education, best practices for food pantries, and working with close-dated food. All of the conversations were spirited and yielded some great feedback and ideas which we will be sharing in our upcoming October partner update. The conversations were facilitated by Operations Manager Sean Ahern, Food Rescue and Beneficiary Coordinator Jacob Matz, and Cathy Pedtke. Finally, we shared conversation over an incredible lunch provided by Moody’s Deli. Long-term supporters of Lovin’ Spoonfuls, the team at Moody’s brought their best for our partners! Conversations throughout the day were engaging and informative, and we hope everyone who attended found the time to be valuable. We hope to make this an annual event and we look forward to hearing feedback from those who joined us today so we can create great programming for 2019!